What did people think about Super 6? Well, what I don’t like about this game is that I couldn’t get a big win from it! Hahaha. However, my one and only session on the game was fairly good, getting an extended playtime from one deposit, and getting 5 Free Spins games, 5 Barrel Bonus games, and luckily getting 1 Trail Climb Bonus game nearing the end of my play. Sadly, all the payouts weren’t that good, mostly ranging from a very low 3x up to 27x, with only one good 90x bet win, but the Trail Climb Bonus game ended on the 30x multiplier level. Argh! I was hoping for a bigger win from this Bonus game as it was so difficult to get, but there you go. Nothing can be certain with games of chance. Nonetheless, this Super 6 game should keep anyone entertained for many plays. I did not like freespin feature. Trailing wilds seems to have some potential for good wins, but I got feature about 5 times, and never won more than 50 bets. Also I prefer stacked wilds or expanding or sticky but not trailing. Never liked it.I did not like low payouts in this game. 5 wilds pay something like 15 bets is is just funny and too low. Of course the task to get wild reels or many wilds in feature, but still it is very hard to get nice payout during normal play. 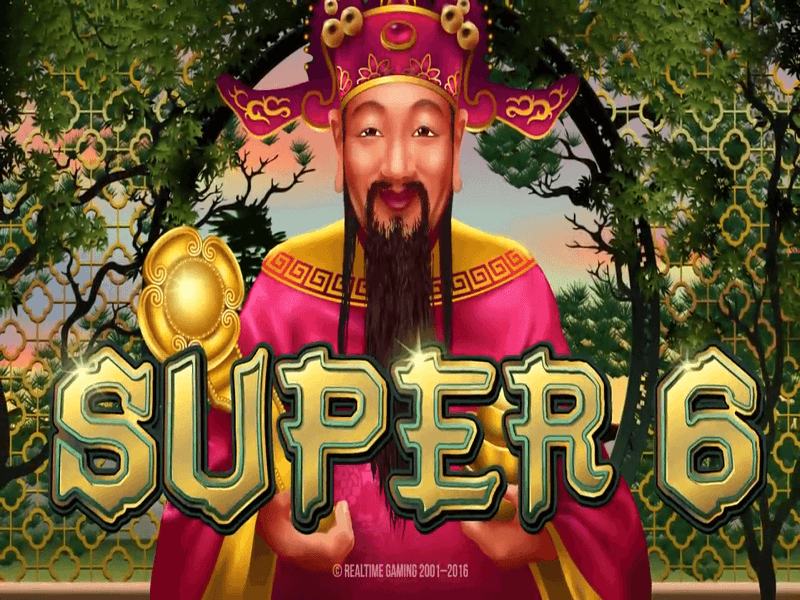 Well, frankly speaking, Super 6 couldn’t deliver the excitement that I was expecting it to give, so it wasn’t any better for me than the game Eggomatic. The base game tended to be boring at times, especially when the Hats just move from reel 5 to reel 1 without being activated. The Wild Reel Hat wasn’t useful at all most of the time, because it would usually turn reel 4 or reel 5 into a Wild Reel but without creating any wins. What a waste. The Free Spins Hat isn’t that bad, but getting more than 10 free spins at a time rarely happens. The Cash Hat prizes are hardly ever big, even though a 100x total bet cash prize can be won, but I didn’t get it. What I did get most of the time was disappointment. Super 6 isn’t a game for me, that’s for sure. The low paytable should be able to provide an extended enjoyable playing time, but this wasn’t exactly the case with this Super 6 game. At times, the game plays well, at other times, it can eat your credits quite fast with numerous low-paying and non-paying spins. Both the Free Spins game and the Koi Bonus fishing game can pay out some decent but mediocre size wins, of which the best I could get was just around the 50x total bet amount. Nothing higher than that so far. With better luck, better wins could be possible, but I ain’t gonna try for it. It’s an acceptable game to play, but not for big-win hunters. There is no bonus game that could be. Well what more can I say in this part I don’t know really. We believe that Super 6 from RTG, which was released 15.06.2016 with RTP 95,00% and Volatility – N/A are worth to play. And remember that is have 3 PAYLINES AND 6 REELS. This and 729 BETWAYS give a chance to win 10000 JACKPOT. You should try to play in Super 6 with 0.3 MIN BET AND 43592 MAX BET.